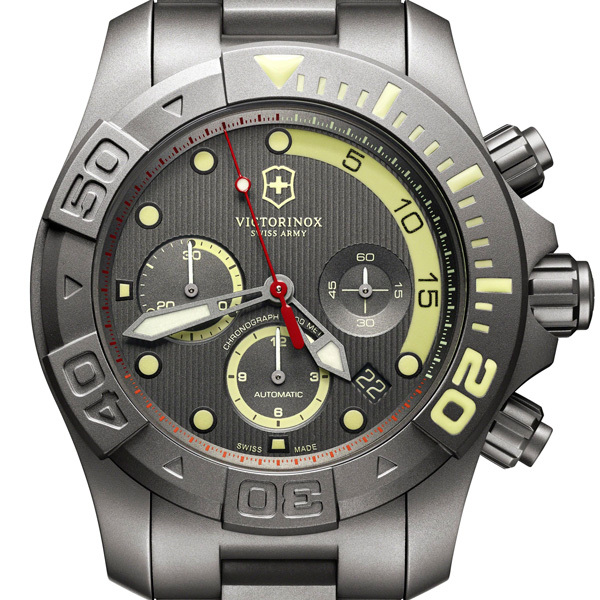 To celebrate its 25th anniversary as a Swiss watchmaker, Victorinox Swiss Army is launch- ing a limited and numbered titanium edition of its famous diving watch. In a first for the Dive Master collection, the 500 pieces in this exclusive 43mm model are powered by a mechani- cal chronograph movement with automatic winding. 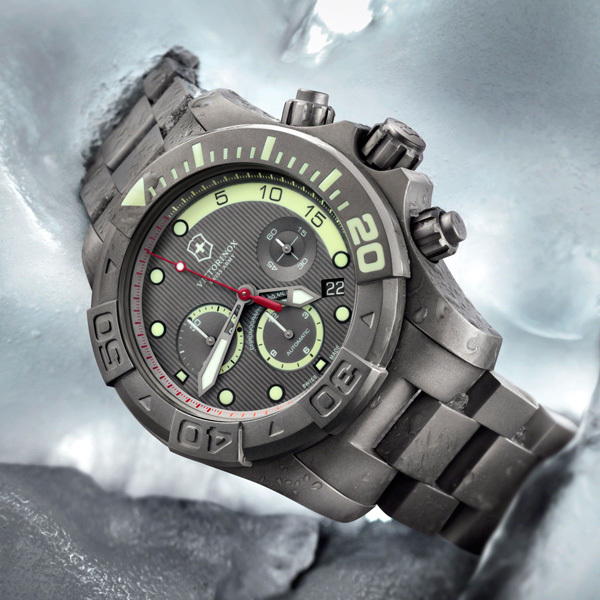 In 2014, Dive Master 500 forcefully demonstrates its durability, reliability and the high quality of its construction. Robustness, reliability and functionality: these are the main qualities of all Victorinox Swiss Army watches. However, Dive Master 500 is especially emblematic of this philosophy: exceptionally tough, it is designed to withstand the test of time. Tested by specialists who regularly communicate their experiences on the internet and in print, the model is ranked among the most reliable in its class. 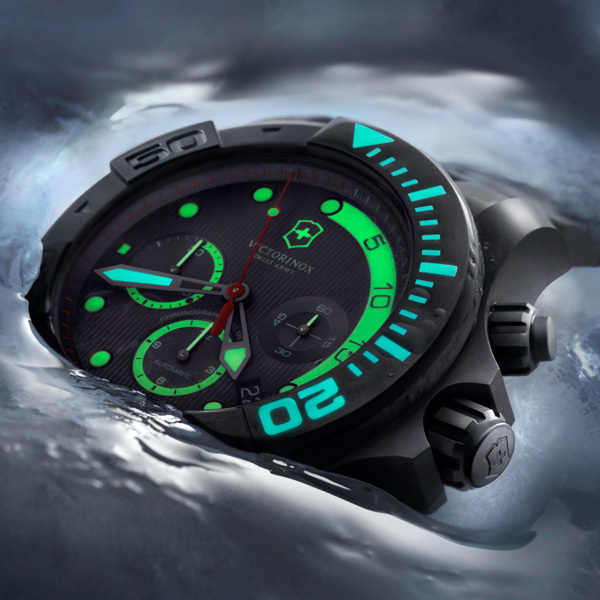 In short, to use a world famous metaphor, it is the “Swiss Army knife” of dive watches. To mark its 25th anniversary in the watch business, the brand is producing a special Dive Master in a limited edition of 500 with several exclusive new features: the 43mm case is in grade 2 titanium, sandblasted mat gray. The treatment also embellishes the titanium bracelet. The dial is in the same monochrome grey, which gives the chronograph a particularly strong graphic look. The quality of the design, however, is not the only standout element. 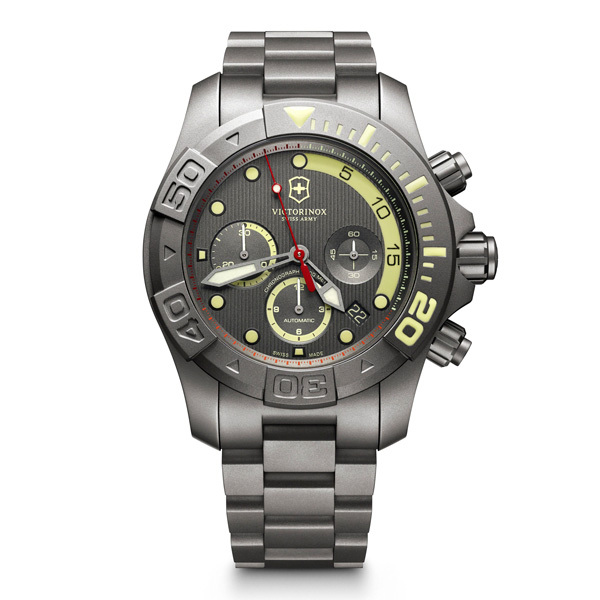 As its name suggests, Dive Master 500 is a genuine diving instrument. The specifications and indications necessary for working in an aquatic environment have not been forgotten. Instead, they have been strengthened in an unprecedented way by the generous use of luminescent material on the indexes and hands, the flange on the right side, and on the 20-minute zone, and the contours of the counters at 6 o'clock and 9 o'clock. Finally, on the unidirectional ro- tating bezel, the 20 minute scale is also specially marked. A subtle and original detail is sure to appeal to aficionados: the luminescent material covering these two important areas, which at first glance is not different from that used on the rest of the watch, changes color in the dark, turning blue while the other indications remain green. Two other standout elements: the helium valve at 9 o’clock on the case middle and the striking “Swiss Army Knife” red of the chronograph second hand. Another first: the watch is equipped with an ETA 2894-2 mechanical self-winding movement, visible through the sapphire crystal caseback. This proven caliber makes the Dive Master not only a genu- ine diving chronograph, but an indispensable companion for everyday life.